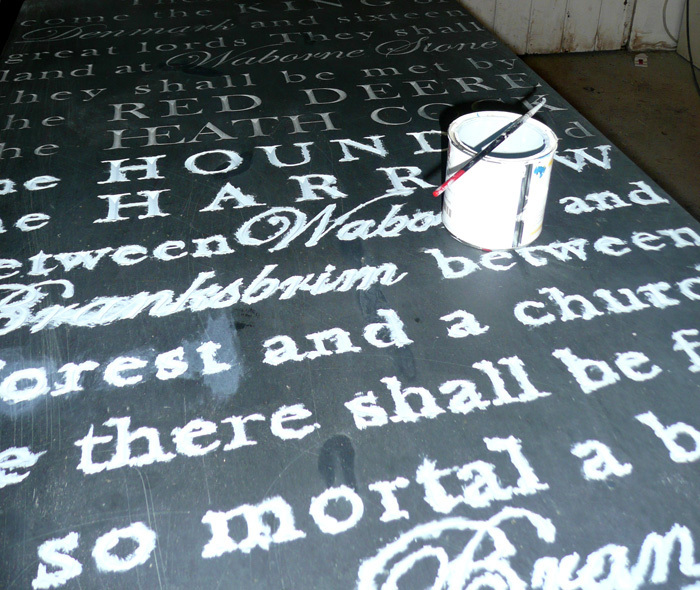 This picture show the ‘flood painting’ technique used to colour the lettering. The paint is applied in a thin coat, but brushed out over the edges of the incision in order to ensure nothing is missed. The surface is then ‘cut back’ with wet and dry paper. I have used a signwriters enamel paint this time. This is one of six large panels for an exhibition I am working towards in Salthouse Church in May/June 2013. Here I’m carving into a slate slab with no preliminary design or drawing. This is an attempt to echo the techniques of 17th-18th century ‘folk carvers’ that made many memorials here and in America. The result will inevitably be unpredictable – with uneven spacing and some words squeezed onto the lines at the end. I am having to shrug off my formal training and let go here. I feel the result will be quite refreshing – and hopefully when I get to the bottom I will have managed to fit on the whole text ! !